SOUTH BEND, IN - The South Bend Cubs, in conjunction with the Chicago Cubs, have announced their 2019 Opening Day roster. The team is compiled of 27 players featuring 14 pitchers, three catchers, six infielders, and four outfielders. Buddy Bailey begins his first season managing South Bend in 2019. Bailey, MiLB's winningest active manager, spent the previous three seasons with the Myrtle Beach Pelicans while winning one Carolina League championship. Pitching Coach Jamie Vermilyea also enters his first year in South Bend. The former Big Leaguer with the Toronto Blue Jays spent the 2018 season in Mesa. Hitting Coach Paul McAnulty returns to South Bend after spending 2018 with the team. The former San Diego Padre and Los Angeles Angel previously coached in the Angels system. Finally, Coach Pedro Gonzalez starts his first season with the South Bend Cubs after previously coaching in the Dominican Summer League. After top pitching prospects headlined South Bend's Opening Night roster last season, the 2019 edition features a solid mix of both highly ranked pitchers and position players. At the top of the pitching ranks is left-hander and #3 overall prospect Brailyn Marquez. The 20-year-old Marquez started two games for South Bend last season, including the regular season finale against the Great Lakes Loons. In his two starts, Marquez tossed seven innings while striking out seven batters. Other top pitching prospects on the Opening Night roster include Ethan Roberts (4th round, 2018), Derek Casey (9th round, 2018), and Riley Thompson (11th round, 2018). In the outfield, South Bend has been assigned 19-year-old outfielder and 2018 Round 2C draft pick Cole Roederer. Roederer has played just 36 professional games with the Cubs organization so far, but he already is listed as the #5 overall prospect. With the Mesa Cubs in the Arizona League, the six-foot, 175 pound outfielder hit .275 with five home runs and 24 RBI. On March 19, Roederer was called up to play for the Chicago Cubs against the Seattle Mariners at Sloan Park. In his first at-bat, he crushed a ball over the center field for a round tripper. 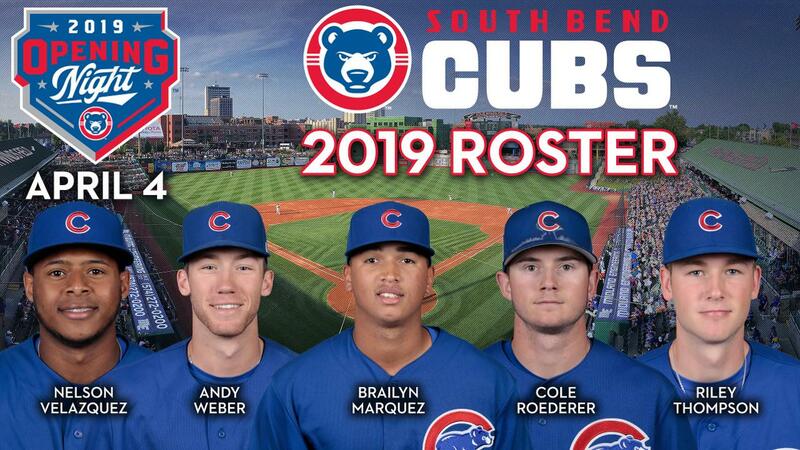 Roederer could be in the starting lineup for the South Bend Cubs on Opening Night, April 4 at 7:05 p.m.
South Bend will welcome back outfielder Nelson Velazquez and infielders Delvin Zinn and Rafael Narea to start the 2019 campaign. Chicago Cubs #30 overall prospect Andy Weber also joins the group for 2019. Weber, drafted in the 5th round in 2018 out of Virginia, hit .291 for Eugene last season. The roster released is only a preliminary roster and subject to change. The Cubs will welcome the University of Notre Dame to Four Winds Field for a 7-inning exhibition game on Wednesday, April 3 at 6 p.m. South Bend will then welcome in the West Michigan Whitecaps for Opening Night on Thursday. For tickets, visit the Four Winds Field Box Office, go to SouthBendCubs.com or call (574) 235-9988. The South Bend Cubs are the Class A minor league affiliate of the 2016 World Series Champion Chicago Cubs. Over the past 31 seasons, the team has won five Midwest League titles, most recently in 2005, and has captured 12 division titles. In 2019, the South Bend Cubs will host the Midwest League All-Star Game. In June 2017, Four Winds Field, home of the South Bend Cubs, was voted Best Class A ballpark in the country by Ballpark Digest. In 2015 the team was named Ballpark Digest's Team of the Year and received the John H. Johnson President's Award, the highest award in minor league baseball. The team is owned and operated by Swing-Batter-Swing, LLC whose principal shareholder is Andrew T. Berlin of Chicago, Ill.